Very Professional. This is where you will find the company with the most training and know how for whatever your project, start from new or experts at fixing other companies messes. Highly recommend David and his crew. Designing, Building, Supplying, Repairing & Maintaining Water Features, Backyard Ponds, Waterfalls & Garden Fountains in Northwestern Michigan since 1996. Serving both commercial and residential ponds, patios & landscapes in Petoskey, Harbor Springs, Charlevoix, Boyne City, East Jordan, Shanty Creek, Bellaire, Torch Lake, and beyond! This pond is in the front yard of a home on Crooked Lake. It blocks road noise and creates a welcoming entrance. This is a pond in our display garden. Using natural water treatments our ponds are safe for family and pets. This is a formal water fall in Harbor Springs. Sometimes on a hot day in Boyne City you just want to stand in your pond and read a good book. In Bay Harbor we have many beautiful and functional water features. In Harbor Springs this waterfall and pond greet the homeowners and guests at the door. Bellaire has many lovely ponds and vase fountains are a great addition. Torch Lake homes have ponds and fountains sprinkled across their lawns. It is beautiful to add some smaller fountains to a larger pond as in this photo. Alanson ponds are wonderful on the old farms and estates. Homes on golf courses often have beautiful ponds. Bellaire and Shanty Creek ponds and waterfalls by Waterpaw Ponds. Adding a vase to a smaller pond in Harbor Springs brought this little pond back to life. Many of the streams we build in Petoskey meander through the trees. Bellaire properties often need a water element. Adding ponds and fountains is a great way to bring the Chain of Lakes into the day to day life of those not on the shore. Waterpaw is your Northern Michigan Pond Expert. 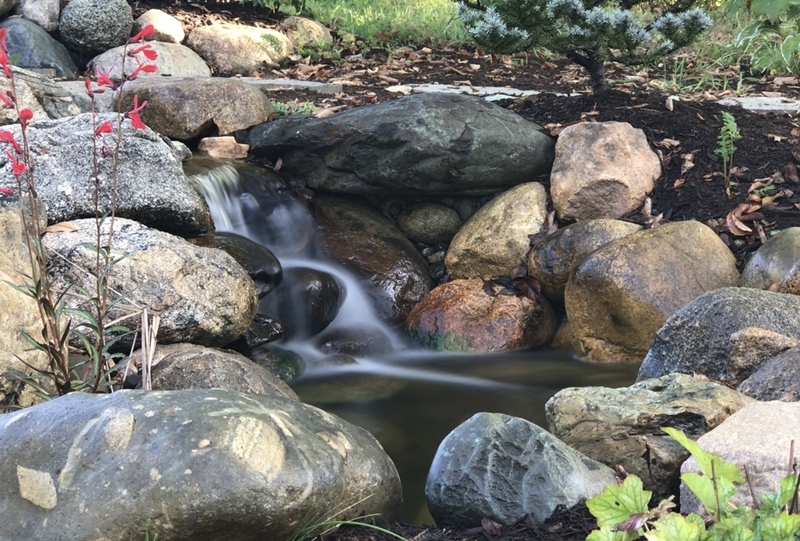 Discover your backyard paradise with Waterpaw, Northern Michigan's backyard legacy experts.We are a truly local company owned and operated by lifelong area residents committed to enhancing Northern Michigan Landscapes, Water Features, Koi Ponds, Waterfalls, and Fountains. You don't want to miss all the cool details that go into a new recreation pond we installed for Robert Arrington of Deer Meat for Dinner. Another great day living the Aquascape Lifestyle! Waterpaw Ponds can create a backyard pond in Northern Michigan as large as 10'x12' with a waterfall in only 1 Day! Our experienced and knowledgable crew can build your dream pond space in only 1 day. Waterpaw Ponds Designing, Building, Supplying, Maintaining and Repairing Backyard Ponds, Fountains, Waterfalls in Northern Michigan since 1996. Add touches of the unexpected to your Northern Michigan home and yard. Bring the nature back into your landscaping with Waterpaw Water Features, Ponds, Garden Fountains, Waterfalls & Streams. Travel often? We install and design water feature systems that can easily be turned off and on with a remote! Serving ponds, patios & landscapes in Emmet County, Charlevoix County, Antrim County and beyond. We are the water feature contractor that can create both residential and commercial yards, courtyards and patio's in Northern Michigan.